Mowtown is a 4-player minigame found in Mario Party 6. This minigame's title is a pun on Motown Records. The only difference between day and night is that there are lit torches in the background at night. The players start up their lawn mowers and advance onto the lawn. The object of the game is to mow the most grass on a small area in a park. 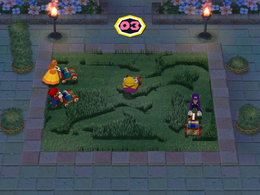 To start mowing, the player must press and hold down the button while moving around. The grass is automatically transported to the player's basket. The player with the most grass in their basket when time runs out wins. The four players stand on a freshly trimmed lawn in front of their baskets. The winner does his or her victory animation, and the others do their losing animations. Rules – "Tame the wildly overgrown lawn with your lawn mower! Whoever collects the most grass clippings wins!" Advice – "If you hit a wall or an opponent, back up and start mowing again." This page was last edited on December 18, 2017, at 09:45.